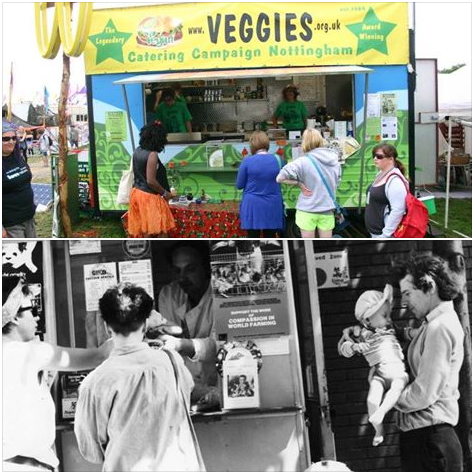 Animal Aid launched their Friend or Food tour for Vegan Month, featuring the recently refurbished Veggies Trailer, decorated as a spoof organic and free-range dog meat catering trailer, at various Nottingham locations on Tuesday 2nd November. With your help the tour can keep rolling on. 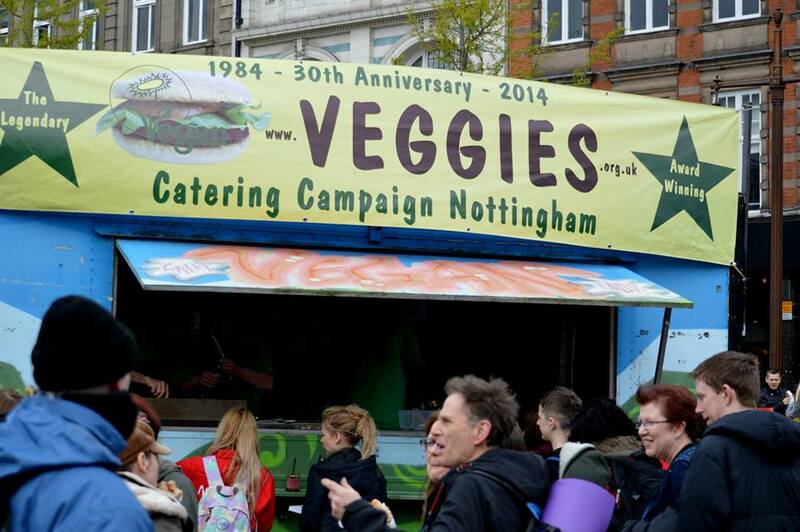 The trailer is now back with Veggies in Nottingham. 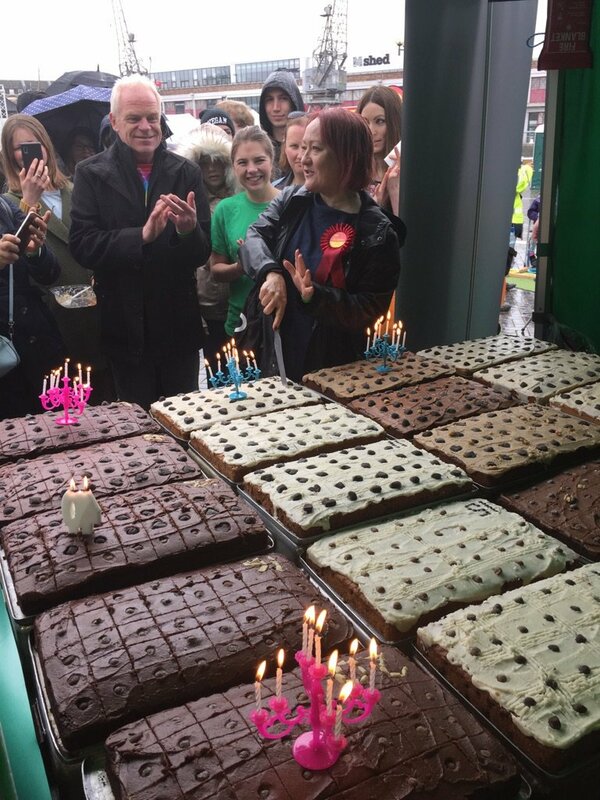 Whilst we love nothing more than campaigning on the streets we can only free up a limited number of days out of our already busy schedule, often giving away actual vegan food rather than fake dog meat! It is therefore best if you can find a driver, vehicle and towbar to pick up and return to Nottingham. Vehicle access to markets and town centres has not been an issue as the trailer is very small and can be unhitched at the roadside and rolled into place. Community support officers, traffic wardens and police have not shown any concern once it is made clear that it is a campaign prop for political or charitiable purposes, citing freedom of speech and rights to protest. ARGUMENT #7: Animals don’t have feelings. July, 2011: Spoof website launched for Panda Meat vs tuna meat. 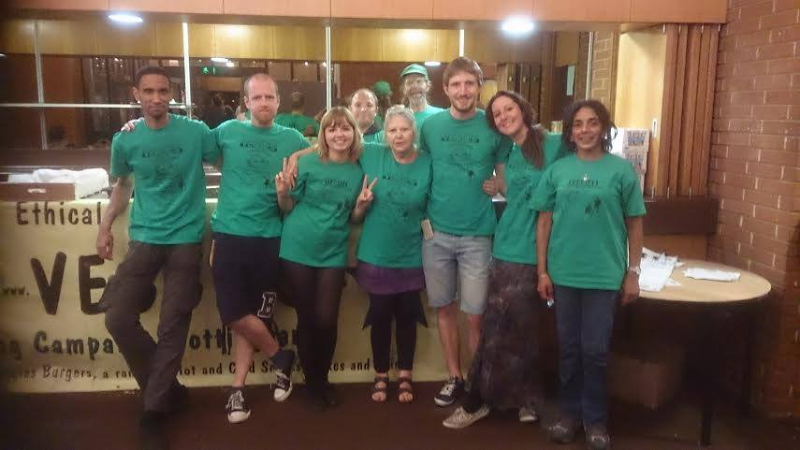 Well done to all the Veggies, Nottm AR and vegan campaign crew for their help with a ‘dress rehersal’ at Clinton Street Market – the original location of Veggies Catering Stall from 1985 – 2002! From here we rolled around to the nearby McDonalds (just down the road from our friends at Lush) on Clinton Street. From there it was another opportuntity to roll on down the hightway for the official campaign launch at 12 Noon right by the Council House on the Old Market Square. Having been denied the opportunity to host the 7th East Midlands Vegan Festival at the Council House, it was appropriate to take it to the streets. 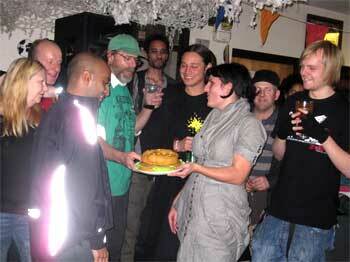 Once we had practiced the patter, the feedback ranged from bemusement to shock. Apologies are due to the woman who was in tears, before we explained that it was all in the best possible taste – ie intended to draw comparisons between the animals who we pet and those who we eat. Pigs are as intelligent as dogs, and like dogs have only one thing precious to them – their right to life. It was initially difficult to find the right ‘line’, so we were very pleased to have had the ‘dress rehersal’. When inviting people “try a free sample of Dog Meat” people were often confused and walked away, and those that did stop struggled with the concept. If they were willing to talk it through though, they eventually ‘got it’ and were generally quite supportive. Another approach was to say that we were interested to know if people prefered pork or beef, claim the dog meat to be as tasty as pig meat and get straight to the point – pigs are as intelligent as dogs, and value their lives just as much. One lady, who eats ‘little meat’ but cooks it for her familiy, ended up challenging her own daughter to carefully read the displays and herself talked through the issues involved. The daughter’s response “my god, what will they be serving next” was very pertinent as the City Council often invite an ‘exotic meat’ farm to cater on the exact same spot. If people are bored by pig or cow meat, and want to try Ostrich, Kangaroo, Crocodile or Wild Boar, then why not Dog! 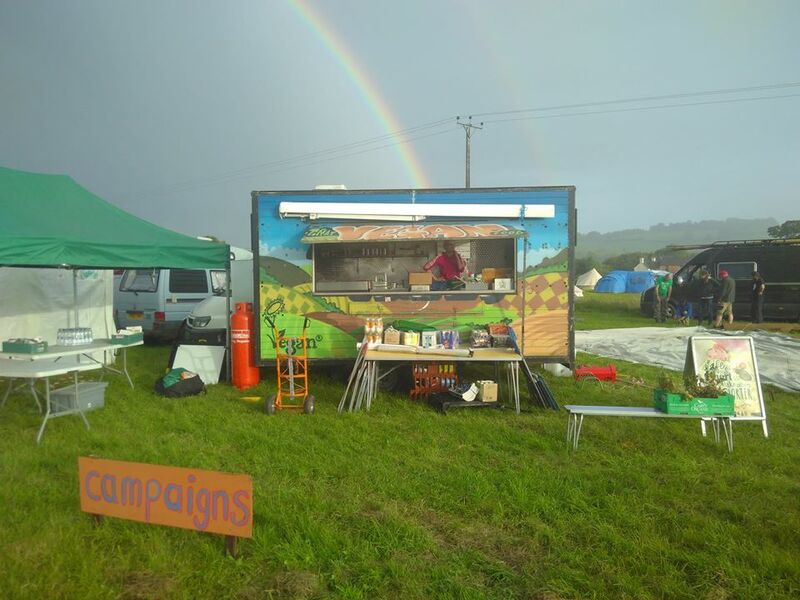 Can you help with our future campaigns? Whether organic, free-range, corn-fed or rested on the finest mattresses, at the end of the day it’s all the same for animals farmed for their flesh. They all end up in the same slaughterhouses; they are all alone and terrified; they are all hung upside down by their hind legs and all end up bleeding to death. To check out the whole story, see the pictures of the trailer and the press release and tour dates. The dog meat trailer is making its way around the country, stopping at markets in 12 cities, as part of Animal Aid’s annual Vegan Month promotion. Tuesday 2nd November – Nottingham Market Square, 12 noon. Wednesday 3rd November – Birmingham Farmers Market, 12 noon. Thursday 4th November – Norwich Market, 12 noon. Friday 5th November – Borough Market, London, 12 noon. Saturday 6th November – Southampton Bargate Market, 12 noon. Tuesday 9th November – Plymouth City Market, 12 noon. Wednesday 10th November – Bristol Farmers Market, 12 noon. Thursday 11th November –Cardiff Market, 12 noon. Friday 12th November – Manchester Real Food Market, 12 noon. Saturday 13th November – Mansfield Park Farmers Market, Glasgow, 12 noon. Monday 15th November – Grainger Market, Newcastle, 12 noon. Tuesday 16th November – Kirkgate Market, Leeds, 12 noon. The Friend or Food Tour is on Veggies Animal Rights CalendAR. 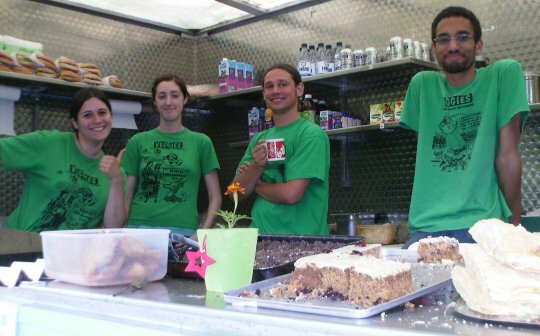 The trailer was last seen at Clinton Street Market in 2002, since when it has been laid up at Veggies’ base at Nottingham’s Sumac Centre. Here’s the trailer at Clinton Street in 1985 with Cathy and a nought-year-old Francis. Since lying idle for 8 years refurbishing the trailer has been a big task. Can you help with some of the costs of this refurbishment? £5 would buy a tin of paint; £25 would pay to fix the windows, £50 would pay for locks; £170 would pay for suspension, wheels and electrics! 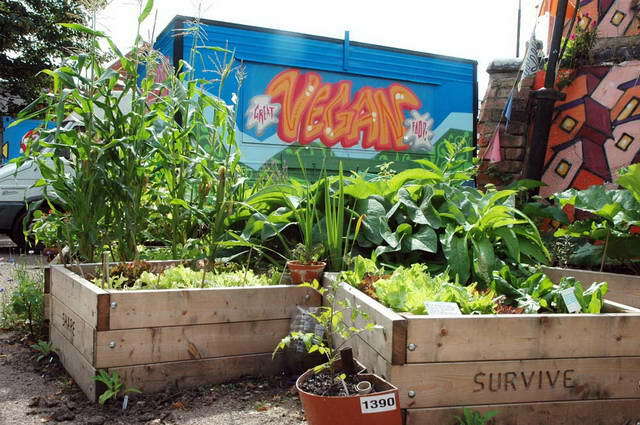 Once the tour is over the trailer will be available as a ‘loaner’ unit for any group or event requiring vegan catering, along with Veggies Catering Campaign, operating out of Nottingham and Something Fishy, based in Manchester. 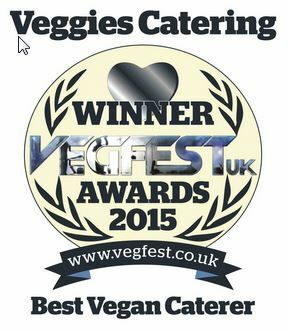 Find other Vegan and Vegetarian Event Caterers on Veggies Directory. This reminds us of a cool poster campaign by the Vegetarian Society some 10-15 years ago. By chance they have a new campaign running at the moment. Check out The Butchers Cat.